Back in 1994, our very own Central Market grocery store opened in Austin, and it immediately became the place where I do a big part of my grocery shopping. In 1994, I was a graduate student, and my shopping list included more frozen food and quick-to-cook things than it does now. But, I remember walking into this brand-new store with the produce section that meanders on and on and discovering starfruit and taking it home to taste it for the first time. There was so much to explore and taste, and my grocery store expectations have never been the same since. I thought about that as I read my review copy of The Berkeley Bowl Cookbook: Recipes Inspired by the Extraordinary Produce of California's Most Iconic Market by Laura McLively. The Berkeley Bowl, in Berkeley California, began as a small, family-run produce shop that has evolved into “one of the nation’s most renowned retailers of exotic fruits and vegetables.” All of the produce continues to be selected by the original owner, Glenn Yasuda, who visits sellers and farmers personally to choose what to order for the store. The new book is a tribute to the variety of foods found there and a guide for using lots of the interesting and seasonal produce throughout the year. The recipes aren’t always traditional to the ingredients being highlighted. For instance, Asian greens may be given a Spanish flavor profile or purple cauliflower may find its way into tacos. But, the dishes are all intriguing. The chapters are grouped by type of produce such as Leaves, Spores and Succulents, and Roots and Tubers. The Spring Chickpea Tabbouleh made with raw chickpeas straight from the pod makes me want to grow my own. And, I want to track down some banana blossoms so I can try the Banana Blossom with Glass Noodles and Crispy Garlic that’s served in the sturdy, outer petals of the blossom. I have some locally-grown, purple snake beans that I’m going to use in a Thai curry tonight, but I can’t wait to bring home more of them to use in the Smokey Snake Beans involving tomatoes and a homemade bbq-style sauce with a recommended side of cornbread. I’ve also marked the pages for Sea Bean and Soba Salad, Aloe Vera and Mango Ceviche in which the texture of the aloe mimics that of fish, and Golden Beet Tamales with Red Pepper Sauce. These days I do still bring a lot home from Central Market, but I try to gather most of the produce I use from local farms. 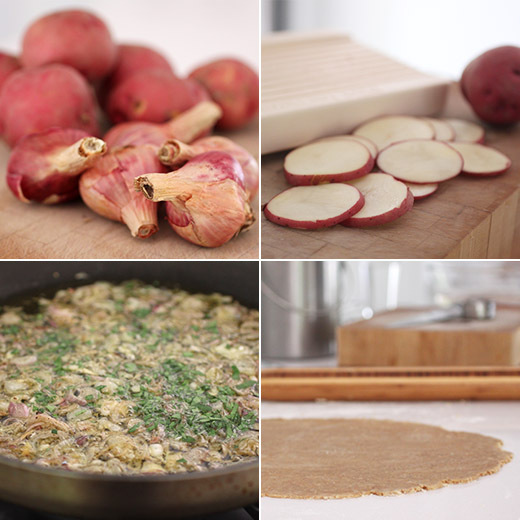 In the spring, potatoes and shallots appear, and I had to try the Potato Galette with Tarragon made with a layer of sauteed shallots. In the book, the galette is made with lovely purple potatoes, and I have found locally-grown purple potatoes here in the past. This time, I went with the red potatoes and shallots on offer at Boggy Creek Farm, and I used my home-grown Mexican mint marigold that has a flavor very similar to tarragon. The recipe suggested any homemade or store-bought pie dough, and I did a little searching through my books for a good olive oil dough. I decided to try the whole wheat, tahini, and olive oil dough found in A New Way to Bake: Classic Recipes Updated with Better-for-You Ingredients from the Modern Pantry . Olive oil doughs are so easy to make, and this one was very easy to roll out and shape for the galette. For the filling, shallots were thinly sliced and sauteed in olive oil until caramelized. Chopped tarragon, or Mexican mint marigold in my case, was added. I also added some chopped sage from my herb garden. The dough was rolled into a 13-inch circle, and the shallots were spread in the center. Potatoes were thinly sliced on a mandoline and placed on top of the shallots, overlapping slightly. The potatoes were brushed with some olive oil, sprinkled with salt and pepper, and topped with more herbs. The dough was folded over the edges and brushed with an egg wash. The galette baked for about 30 minutes. I crisped some sage leaves in olive oil to add on top of the baked galette. Sour cream is suggested for serving, but I loved the galette just as it was. This is a great make-ahead dish since the galette can sit at room temperature and holds up perfectly. You could serve thin slices with cocktails or larger slices as a meal with a salad. It’s the kind of simple dish that really puts the freshness of the ingredients into the spotlight. This book is going to come in handy for cooking with what’s locally grown and some store-bought, new-to-me produce. Recipe reprinted with publisher’s permission from The Berkeley Bowl Cookbook: Recipes Inspired by the Extraordinary Produce of California's Most Iconic Market . Fanned out across a flaky pastry smeared with caramelized shallots, this deep royal purple potato is a showstopper. 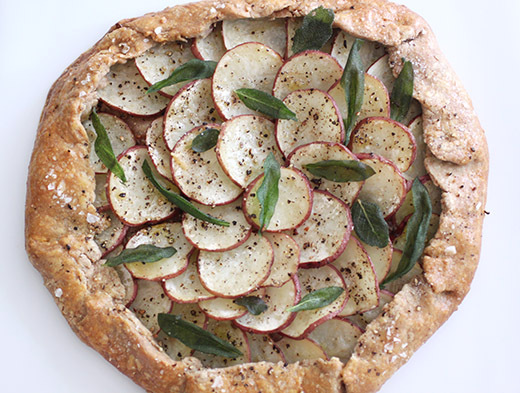 A sprinkling of fresh tarragon and a dollop of sour cream balance the galette’s richness. Serve for brunch or lunch alongside lightly dressed mixed greens. Heat 2 tablespoons of the olive oil in a skillet over low-medium heat. Add the shallots and sauté on low for 20 minutes, or until the shallots are soft and caramelized. Turn off the heat and stir in half of the tarragon, half of the salt, and some pepper. Set aside to cool slightly. Use a mandoline or a sharp knife to cut the potatoes into 1/16-inch-thick slices. Set aside. Preheat the oven to 375°F. Use a rolling pin to roll the pie crust thinner and into a 13-inch circle. Line a baking sheet with parchment paper and place the crust on it. Spread the shallots over the pie crust, leaving a border around the edge (about 1 1/2 inches). Starting from the outer edge of the shallots, place the potato slices on top the shallots in overlapping layers, spiraling inward. Use a pastry brush to brush the potatoes with the remaining olive oil and sprinkle the remaining salt. Fold the border of the dough up and over the potatoes, pressing down in loose pleats. Brush the exposed dough with the beaten egg and bake for 28 to 32 minutes, until the crust is golden and the potatoes are tender. 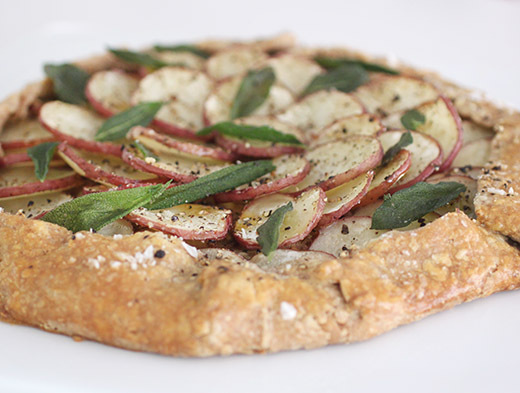 Sprinkle the remaining tarragon over the galette and serve with dollops of cold sour cream. Adore savoury tarts! Those baby purple potatoes are so gorgeous! What a lovely write up! Thanks so much for spending so much time reading through my book. Sounds like you’ve earmarked some of my favorite recipes (I LOVE sea beans). And lovely galette! Looks pretty with the red skins and herbs. Thanks again! I can't wait to try more things from the book--and to visit The Berkeley Bowl one of these days! We don't have anything like Central Market, alas, but even pretty ordinary supermarkets have really upped their game. Loads of stuff in the produce department these days, including a LOT of locally grown stuff in season. Anyway, sounds like a neat book, and I'll never say no to any kind of galette. Love the idea of potatoes in this one -- sounds so good. Thanks! mexican mint marigold sounds excellent! it's definitely new to me, though i am familiar with tarragon. what a delightful galette!